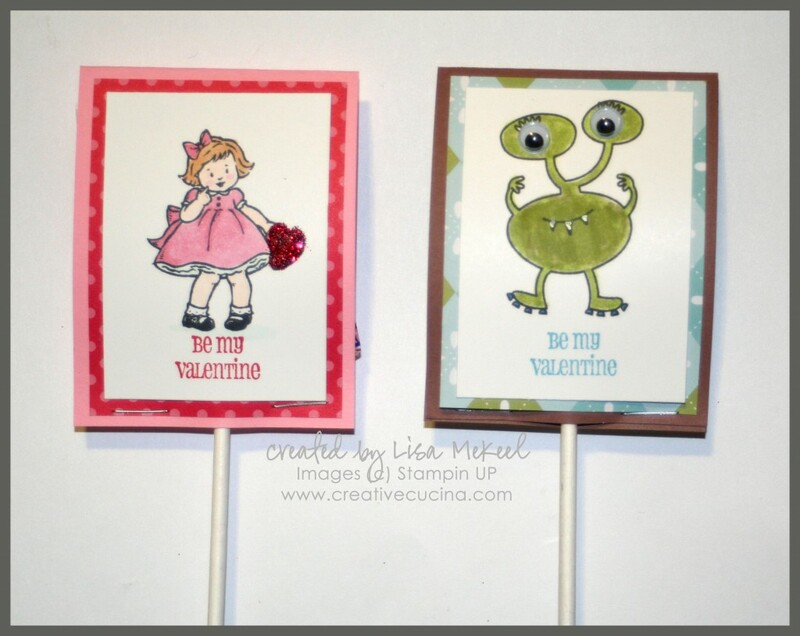 Here is a cute idea for class valentines. 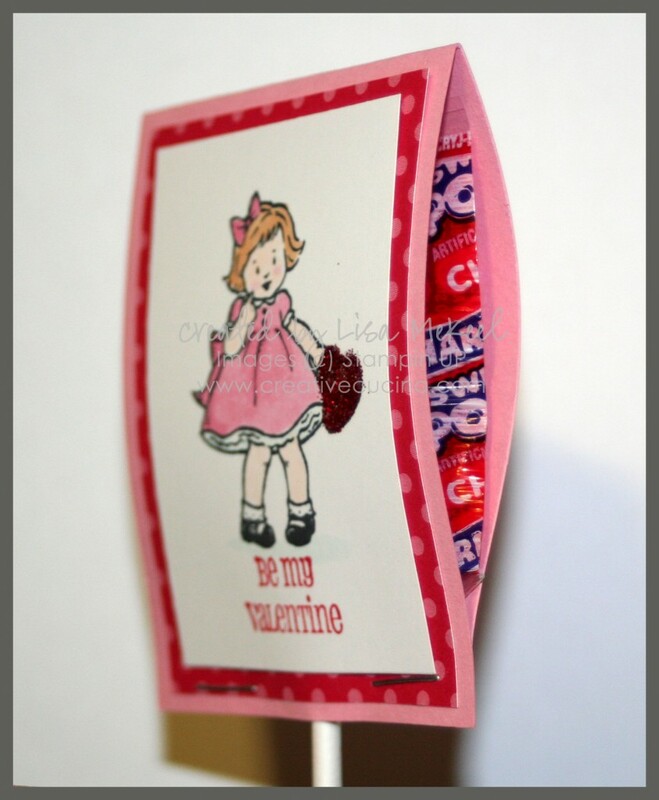 The little cards are covering Charms Sweet Pops. 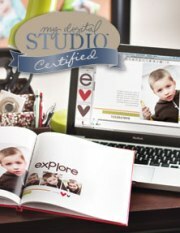 For the girls in the class, I chose to use the Greeting Card Kids stamp set. The little girl holding the heart is adorable! I stamped the image on Whisper White card stock (2″ x 2 3/4″) with Memento Tuxedo Black ink and colored it in with Copic Markers. On the heart, I used the 2 way glue pen and romantic red glitter for a bit of sparkle. The sentiment is from Filled with Love stamped in Real Red ink. That piece is matted onto designer paper (2 1/4″ x 3″) from the Love Patterns DSP (part of the Filled with Love Promotion but can be purchased separately as well). Finally, the card base is Pretty in Pink card stock (2 1/2″ x 6 1/2″) folded in half. I stapled the bottom closed after sliding in a lollipop. As for the boys, my daughter and I chose Make a Monster stamp set. The image was stamped with Memento Tuxedo Black ink and colored with Copic Markers, then I went over it with Pear Pizzaz Marker so it would match the green in the Nursery Suite DSP. The card base is Close to Cocoa (retired). To make the card a bit more fun, I gave the monster some googly eyes and highlighted his teeth with the Signo White Gel Pen. The sentiment is from Filled with Love, stamped in Marina Mist ink. 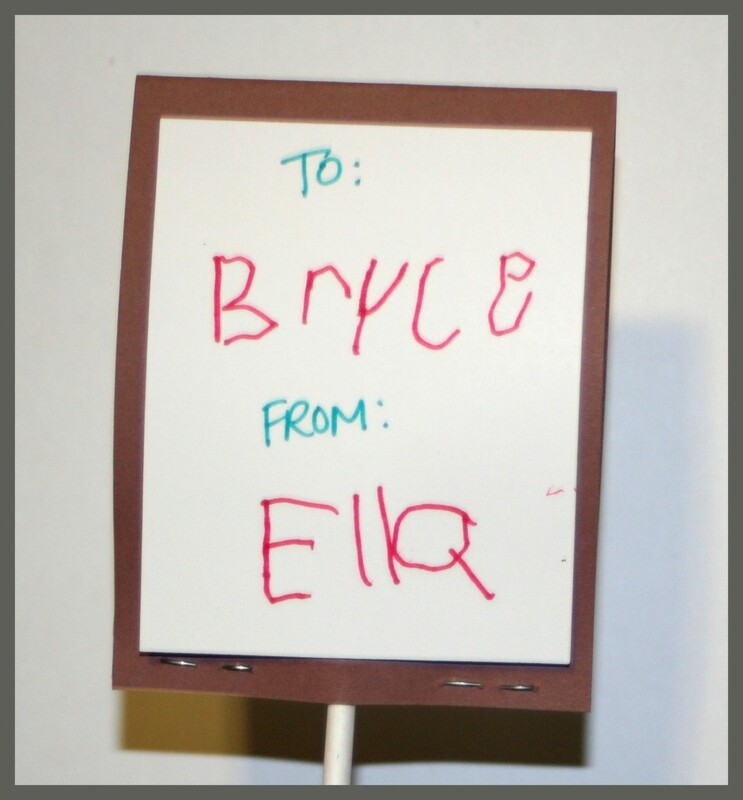 On the back, I added some Whisper White card stock and had my daughter write her classmates’ names, as well as her own. I finally got around to placing a preorder from the 2010 Occasions Mini Catalog and it’s just what I needed to get back in the swing of things. Although there’s snow outside today, I’m in the mood for Spring and these butterflies made with the Beautiful Wings Embosslit and the Big Shot called to me instantly. 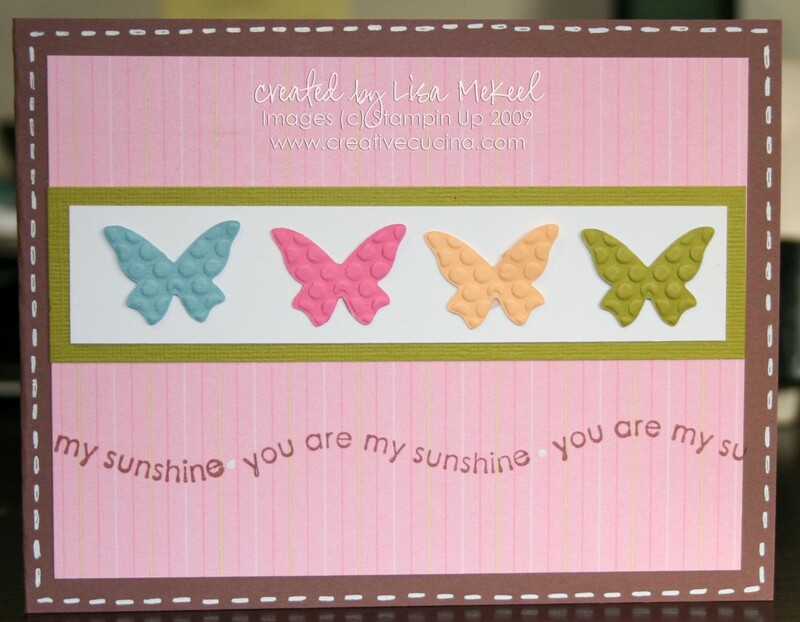 The card base is Close to Cocoa card stock, layered with a piece of Shades of Spring Designer Series Paper. Around the edge of the card front, I used my Gel Pen to add a little stitched outline. As I mentioned earlier, the butterflies were made using the Beautiful Wings Embosslit with Kiwi Kiss, Apricot Appeal, Regal Rose, and Baja Breeze Card stock. I adhered them to a strip of Whisper White card stock using Mini Glue Dots. I layered the strip of white card stock on Kiwi Kiss and attached it to the card front with SNAIL adhesive. The sentiment is actually from the new stamp set Something Sweet. I opted to order the clear mounted version and it really is easy to use. Not as quick as the wood mounted (just peel and stick to the wood block–ready to use). I have to get used to the new system of mounting each time, stamping, cleaning, and putting away. But the ease of storage is really winning me over! It’s really just one additional step (finding the block and mounting the stamp) so I think I’ll get used to it pretty quick. I stamped the “you are my sunshine” stamp in close to cocoa ink. Since I was using a clear block and could see the stamp, placement was easy and no stampamajig was needed! In between each stamp, I added a white dot with my Gel Pen.